This one was inspired by my girlfriends request to help her out with a hydroponics project. She’s an instructor on the Mobile Launch Pad which is run by the North Carolina Community Colleges. They want to make a hydroponics display that had a hands on feel to it, but there was some concern about time and maintenance. This wouldn’t be like a house plant that you could just move wherever you like… or could it? 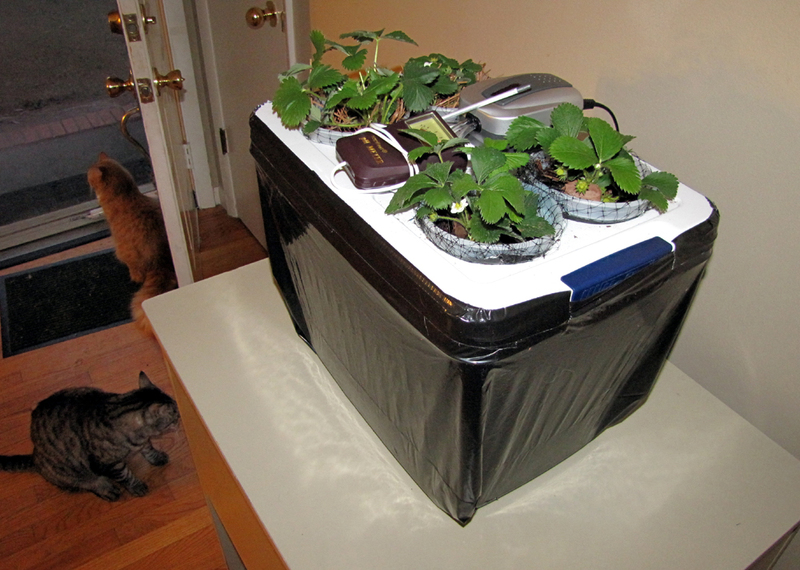 So I decided to build a mini-Hydroponics, or Aeroponics set up here at home to test out ideas and so I could give them a report as to what it takes to grow plants in water and how portable this might be. After some research and a lot of learning along the way I have come to realize that there’s more than meets the eye when it comes to hydroponics. Since we won’t be using soil, we’ll need some other medium to convey water and nutrients to the plant but how? Soil is easy because it’s where plants just naturally grow. All of the major and minor elements are there ready for the plant to absorb through it’s roots. What if we just put the plant right into water? We would need to add all the nutrients the plant needs to the water. Water is a bit different everywhere. It can vary in how many dissolved solids are present. Too many dissolved solids in water can quickly become a problem in a small hydroponics setup. The PH of the water is another important factor. It should be between 5.0 and 7.0. Too alkaline (7.0-) and the plant can’t absorb the minor nutrients such as iron. Lack of Iron will show itself as yellowing leaves. Too low (5.0) and the roots can suffer. This all means that we need a fertilizer that has a good balance of Nitrogen, Phosphorus, and Potassium. These are represented as numbers on the fertilizer labeling. The fertilizer I choose, Jacks Classic, has and even blend of 20-20-20. This means it has 20% Nitrogen, 20% Phosphorus and 20% Potassium. PLUS, it has all the minor nutrients like Copper, Iron, Manganese, Molybdenum and Zinc. The minor nutrients are the ones that usually have to be derived from the soil. Most plant foods like Miracle Grow don’t have enough of the minor elements to work well with hydroponics. The plants will start off fine, but gradually fail due to lack of certain nutrients at different stages of it’s development. One important thing to take note of. I used a clear plastic tub for this project for visual purposes. Once my setup was complete. I wrapped the entire tub in two layers of black trash bag plastic and taped it in place. This keeps out ambient light which will lead to algae growth in the water. An alternative light blocking method is to find a very dark container or simply spray paint the outside of it all black. This setup is pretty simple and all the parts and materials are readily available at most hardware stores, pet supply stores and plant nurseries. It is however, EXPERIMENTAL> This is a first attempt at hydroponics and I plan on posting updates on this project so check back often. Enjoy the video… all he info you need to build this is there.